Flower Power is one of those wonderful herbals that you just fall in love with and indeed it is one of my very favorite books. Steeped in lore and tradition, this lovely member of the rose family has a long history of use in healing humanity’s woes. It’s historical use stretches around the globe from cultures in Europe to China and on to the Native Americans. Here are some of our most successful night-time strategies and helpers for helping kids and their parents with nightmares and night terrors. Nature has blessed us with so much. Looking to Nature we can find a multitude of amazing plant allies that can help the whole family stay nourished and healthy during the winter months. A favorite is elder berry which has an extensive traditional use as a preventative for the flu and as a support during the flu. In fact modern research has found elderberries to be active against the flu virus. You can easily make a yummy syrup from elderberries to take on a regular basis during flu season. This is something that most kids really enjoy taking which is a major plus! If you don't want to make your own syrup a ready-made preparation of elderberry Sambucol can be purchased at most natural food stores. And if despite your best efforts, sickness should take hold, syrups can be used during a bout of the flu to hasten healing. We make the following easy delicious recipe for syrup every year. Directions: Simmer the elderberries and spices in 3 cups of water. 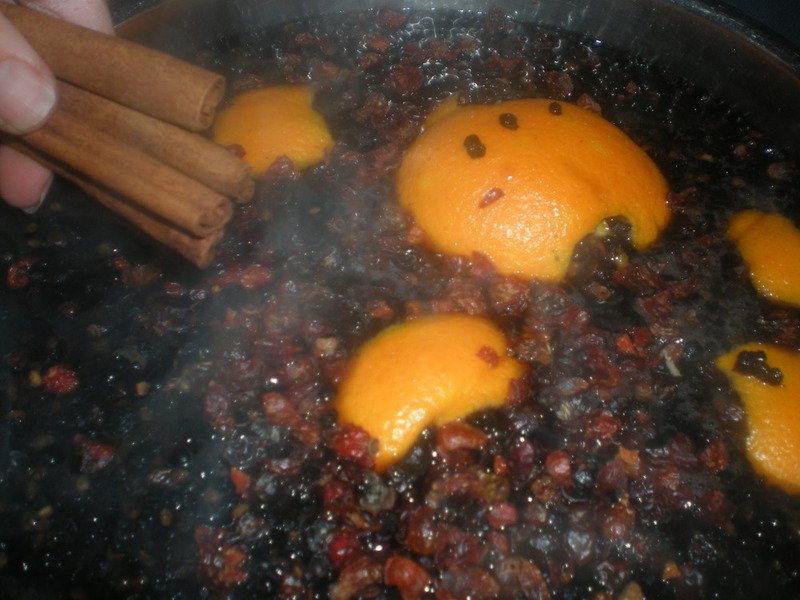 Once the berries have softened smash up the berries and spices in the water. This is a fun part to have children help with. I use a potato masher and closely supervise my kids while the squish away to their hearts delight! Cook at a low boil for about a ½ hour or until the liquid reduces by one-half. Strain the mixture with a fine mesh strainer. Make sure to get all the seeds out, which can be somewhat irritating to the digestive tract. Return the liquid to the pot and add the honey. Heat until the honey just melts. Then bottle, label (include the date!) and refrigerate your new syrup. It will keep in the refrigerator for about three months. Take 2 to 3 teaspoons for adults and 1 teaspoon for children (ages 2 and up) 3 to 5 times a week as a prophylactic during flu season. If you do happen to get sick with a bout of the flu take the same dosage about four times per day. Only the blue elderberries (Sambucus nigra) should be used as the red ones are toxic. Elderberries are generally considered to be quite safe though they can be drying and irritating for folks suffering from migraines. If you have a reaction, stop taking it immediately. Recipe and information from Brigitte Mars's Elder. A highly knowledgeable herbalist, Brigitte Mars lovingly offers her treasure trove of information for us to all learn from. Her classes are lively, fun and interesting. Her books offer an extremely valuable resource to those wishing to study herbs and learn about healthy living. The spices included in this recipe not only make it taste delicious but also help to warm the body, decrease inflammation and support healthy digestion. Other herbs can be added to this syrup to increase its protective properties. Rose hips are soothing and will provide nourishing vitamin C and bioflavonoids. Astragalus has long been used in Traditional Chinese Medicine as a tonic to the immune system particularly to prevent illness. However, this herb should not be used during illness as it can drive infection deeper into the body. So do not take astragalus during the flu or cold. A great herb for children’s health is lemon balm. This yummy plant is antibacterial and antiviral, while also calming the digestive and easing nervous energy. Add any of these herbs by the handful to the pot with the elderberries be sure to also add a little extra water during the simmering and a bit more honey. Note that this information is in no way meant to take the place of professional medical care. Please use common sense and see a doctor if you need one. See Healthy Use of This Information.